Roger Woodward surprised some by including Bach in his concert performance of Debussy and Chopin at the Radio Bremen concert hall in January 2007. Woodward simply explained that to him Bach was a romantic composer as well. This only sounds daring until one has listened to the recording at hand. And one should also remember that Friedrich Blume, in the authoritative German music dictionary MGG, wrote more than half a century ago that "Bach's language anticipated much which was later expressed during the German Romantic era". This is Woodward's first recording of works by J.S. Bach although he had played Bach all his life. As one can expect from a musician of Woodward's calibre this is an interpretation outside the square. Already in the first part, the Fantasia from BWV 903 - composed in Coethen around 1720 - a deep understanding is shown of what might have caused Bach to place this 'free' section ahead of the Fugue. Woodward plays the Fantasia as such. 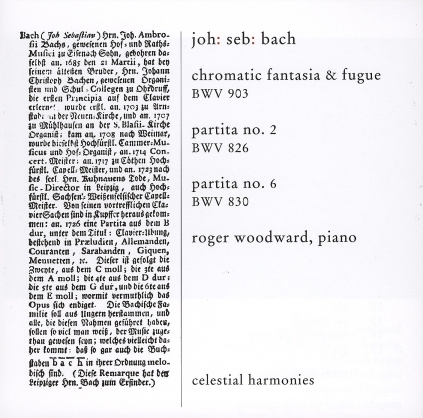 In the ensuing Fugue Woodward shows his complete understanding of the structure, takes all those liberties, however, which Bach had always expected of himself as well as of all performers of his music. The Partitas No. 2 in c minor BWV 826 and No. 6 in e minor BWV 830 might also go back to the time in Coethen around 1720, chronologically not far removed from the Chromatic Fantasia and Fugue in d minor BWV 903; they originate from Bach's most productive stage in his life as far as secular music is concerned, and they show the composer at the height of his creative power. Bach published them himself in Leipzig in 1726. Woodward's recording was produced in Wörthsee, Bavaria, on the same Hamburg Steinway D which he had used for his Chopin Nocturnes (Celestial Harmonies 14260-2). By now he knew the instrument well and felt totally familiar with it. Of the producer and engineer Ulrich Kraus Woodward remarks that he is a musician rather than a technician; a friendship links musician and engineer who by now have not only co-operated in the recording of Chopin but also in that of the large cycle 'Of the Sound of Life' by Peter Michael Hamel (Celestial Harmonies 13256-2). Woodward speaks with the greatest respect of the interpretations of the past - George Malcolm, Helmut Walcha, Gustav Leonhardt to name just a few. Nevertheless he goes further and beyond anything that might be considered orthodox or conservative. But this is an organically continuing development which uses and incorporates all the possibilities that a first-rate modern instrument has to offer, just as Bach would have done if the available technology in his lifetime had allowed him. From that point of view Woodward continues what Glenn Gould started in the sixties and Alexis Weissenberg continued in the seventies: to understand Bach as an ever-new, always contemporary composer whose unequalled greatness manifests itself in the endless possibilities of an ever-new understanding. Als Woodward Anfang 2007 unmittelbar vor der Aufnahme dieser CD bei Radio Bremen Chopin, Debussy und Bach in sein Konzertprogramm aufnahm, waren einige überrascht. Zur Erklärung sagte er nur, für ihn sei Bach eben auch ein romantischer und impressionistischer Komponist. Das klingt nur solange gewagt, bis man die vorliegende Einspielung gehört hat. Und man sollte dabei in Erinnerung behalten, daß Friedrich Blume in MGG schon vor über einem halben Jahrhundert schrieb, daß Bachs Sprache über die Zeit vorausgegriffen [hat] auf das, was in der deutschen Romantik zum Ausdruck gekommen ist. Dies ist die erste Veröffentlichung Woodwards mit Werken von J.S. Bach; und das, obwohl Woodward stets Bach gespielt hatte, ein Leben lang. Wie bei einem Musiker vom Range Woodwards nicht anders zu erwarten, ist es eine Interpretation außerhalb der Schablone. Schon der erste Teil, die Fantasie, aus BWV 903  entstanden in Cöthen um 1720 - zeigt ein tiefes Verständnis dessen, was Bach wohl animiert haben mag, diese ,freie' Werk der Fuge voranzustellen; Woodward spielt die Fantasie eben als solche. Bei der Fuge zeigt Woodward sein vollkommenes Verständnis der Struktur, nimmt sich hingegen alle diese Freiheiten, die Bach schon immer sowohl von sich selbst als auch von seinen Interpreten erwartete. Die Partiten Nr. 2 c-moll BWV 826 und Nr. 6 e-moll BWV 830 gehen wohl auch auf die Zeit um 1720 in Cöthen zurück, zeitlich nicht weit entfernt von der Chromatischen Fantasie und Fuge d-moll BWV 903; sie stammen aus Bachs wohl produktivstem Lebensabschnitt, was weltliche Musik angeht, und zeigen den Komponisten auf der Höhe seiner kreativen Schaffenskraft. Bach veröffentlichte sie um 1726 in Leipzig im Selbstverlag. Erkenntnisreich für das Verständnis Woodwardscher Interpretation ist die Tatsache, daß er für die Partita Nr. 6 im Studio ganze 3 Minuten länger braucht als im Konzert. Es ist eine tiefere, bedächtigere, durchdachte Version, in der sich Details zeigen, die im Konzertsaal vielleicht nicht hörbar oder in angemessener Form vermittelbar wären. Woodwards Produktion entstand im Januar 2007 im bayerischen Wörthsee auf eben dem Steinway D, den Woodward bei seiner 2006 entstandenen Aufnahme der Chopin-Nocturnes (Celestial Harmonies 14260-2) benutzt hatte; inzwischen fühlte sich Woodward mit dem Instrument total vertraut, wenn nicht heimisch. Über den Produzenten und Tonmeister Ulrich Kraus sagt Woodward, er sei ein Musiker, kein Ingenieur; eine Freundschaft verbindet Musiker und Tonmeister, die inzwischen nicht nur bei Chopin, sondern auch bei der Einspielung des großen Zyklus Vom Klang des Lebens von Peter Michael Hamel (Celestial Harmonies 13256-2) zusammengearbeitet hatten. Woodward spricht mit größtem Respekt von den Interpretationen der Vergangenheit, George Malcolm, Helmut Walcha, Gustav Leonhardt, um nur einige zu nennen. Dennoch geht er in seinen Bach-Interpretationen weit über alles hinaus, was als orthodox oder konservativ gelten könnte. Aber es ist eine organische Weiterentwicklung, die alle Möglichkeiten eines erstklassigen zeitgenössischen Instruments berücksichtigt und einbezieht, so wie es wohl auch Bach getan hätte, wenn es zu seinen Lebzeiten die existierende Technologie erlaubt hätte. Insofern führt Woodward das fort, was Glenn Gould in den 60er und Alexis Weissenberg in den 70er Jahren begonnen hatten: Bach als immer neuen, immer zeitgenössischen Komponisten zu verstehen, dessen unerreichte Größe sich eben in den stets unendlich vielfachen, immer neu erscheinenden Interpretationsmöglichkeiten dokumentiert. Roger Woodward studied piano at the Sydney Conservatorium of Music, University of Sydney, with Prof Alexander Sverjensky (a pupil of Sergei Rakhmaninov) and in the class of Prof Zbigniew Drzewiecki (a pupil of Ignazy Paderewski and lifelong friend of Szymanowski and Artur Rubinstein) at the National Chopin Academy for Music, Warsaw. He works with young artists in many countries and participates on the juries of international competitions. Together with the musicians of the Alexander String Quartet he is Professor at the San Francisco State University and author of publications covering a wide field. He founded and directed the London Music Digest, Kötschach-Mauthner Musiktage, Sydney Spring International Festival of New Music and Joie et Lumière series, Bourgogne. Woodward has performed at international festivals on five continents, including Sviatoslav Richter's Festival at Grange de Meslay, Tours, on several occasions; has made television documentaries for the BBC with Xenakis and Boulez and video documentaries with Stockhausen, Cage and Arvo Pärt. He is Commander of the Polish Order of Merit (1993) and will receive the Polish Order of Solidarity in 2008; a Chevalier in the French Ordre des Arts et des Lettres (2005); Officer of the Order of the British Empire (1980) and Companion of the Order of Australia (1992), where he was designated a lifelong National Treasure by the Australian National Trust (2005). Roger Woodward performs with the major orchestras and conductors including the Leipzig Gewandhaus, New York, Los Angeles and Israel Philharmonics, Orchestre de Paris, the Cleveland Orchestra, London Philharmonia and EEC Mahlerjugendorchester directed by Claudio Abbado, Pierre Boulez, Charles Dutoit, Eliahu Inbal, James Judd, Lorin Maazel, Sir Charles Mackerras, Sir Roger Norrington, Kurt Masur, Zubin Mehta, and Edo de Waart. He also worked with Paavo Berglund, Eric Leinsdorf, Witold Rowicki, Georges Tzipine and Walter Susskind. He performed new works by Gilbert Amy, Jean Barraqué, Anne Boyd, James Dillon, Franco Donatoni, Morton Feldman, Rolf Gehlhaar, Peter Michael Hamel, Askell Masson, Richard Meale, Olivier Messiaen, Hans Otte, Arvo Pärt, Horatiu Radulescu, Larry Sitsky, Karlheinz Stockhausen, Toru Takemitsu, Xu XiaoSong and Iannis Xenakis. As a composer, Woodward was commissioned by the Festival d'Automne à Paris for the bicentennial celebrations of the French Revolution with his works performed in the UK, Poland, France, Spain and at the Sydney Spring International Festival of New Music. His passion for chamber music involved him in performances with a wide range of artists including the Vienna Trio, Alexander, Arditti, Edinburgh and Tokyo String Quartets, Jacques Thibaud Trio/Quartet, Frank Zappa, Ivry Gitlis, Synergy Percussion (Sydney) and with the Sydney Dance Company in a production of Xenakis's Kraanerg. The London Guardian described him as a "pianistic genius"; Le Monde de la Musique, Paris, for his Debussy performances, as "magnificent"; in Edinburgh, he was described as a "musician's musician" and at the Toulouse Festival, the French Press wrote: "Roger Woodward compte parmi les musiciens internationaux de premier plan à notre epoque". The Financial Times, London, called Woodward "one of the most consistently exciting and convincing interpreters of virtuoso avantgarde music".